Mobile toilets for the elderly come in different shapes and sizes, and you have to know what to look for when buying one. But they are often an important part of a senior’s bathroom safety plan. I am going to present five great bedside commodes with explanations to help you. I am also going to give some tips for buying and using a bedside commode, as well as answer some frequent questions which may concern you. In a hurry? Here is a quick list of the portable commode toilets that I recommend. If you’d like to learn more about any of these or learn how to choose one yourself, keep reading. I will start off with the best. 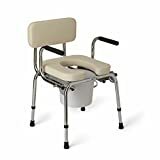 This is a great option for people who want the most comfortable commode. It is a high-end product that had padded seat and armrests, which can be moved. The height of the chair can be adjusted so that everyone sits comfortably. This chair seat is extra large (16×16 inches) and has an open front to make cleaning easy. The distance between armrests is even bigger, so you will surely have enough space. The maximum weight for this commode is 300 lbs. Another benefit of the UltraCommode is that it can be folded or assembled without tools in less than 60 seconds. That makes it great for storage or travel. Materials used for building this chair are high quality – the padding won’t absorb water, and the aluminum frame won’t rust. People who have bought this product are extremely satisfied. They say it is easy to set up and adjust the height. The commode is extremely comfortable, much better than the plastic most chairs offer. The build quality is superb and this is a durable product. Next, we have a basic portable potty for adults that will do the job. It is my budget pick, because you get a well-built product. It has a steel frame which opens and folds easily for storage and transportation. The total weight capacity is 350 lbs so it will fit some of the larger seniors. It comes with a snap-on seat and lid, as well as 7.5 qt commode bucket with a cover and a splash shield. This commode can also be used as a raised toilet seat, and thanks to its sturdiness, it is very useful both beside the bed and in the bathroom. 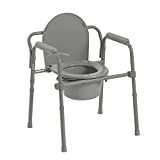 Users of this portable commode for elderly say that it is very handy. Thanks to its steel frame it provides enough support. It is very easy to clean, and some people even used it as a shower chair. This one is a great combination of price and quality. This is the most eye-pleasing option on my list. It looks very much like a regular chair. Its seat and backrest are made of firm composite plastic, but are shaped for comfort. The plastic is infused with Microban Antimicrobial Protection, which inhibits the growth of microbes that cause stains and odors. The commode has an aluminum frame with 400 lbs maximum capacity. Plus, the seat can be finely adjusted in 1/2 inch increments so the chair becomes a perfect fit for anyone. The seat opening is elongated and the backrest is adjustable too. The flat-seat lid cover conceals the commode nicely. These are often used over a toilet to raise the seat, increasing stability. A splash guard for over-the-toilet use is included. People using this toilet say it is very user-friendly because it’s the same size as a regular elongated toilet. Most of the smaller round commodes are too small, and some are not fitting for men. It is also sturdy and durable. It is very eye-pleasing, it looks and can be used as a regular chair. 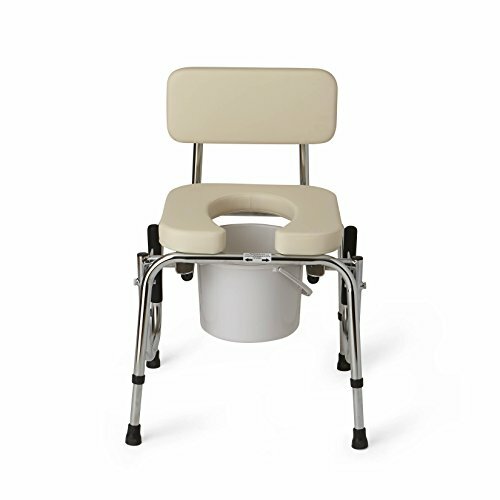 This potty chair has additional antimicrobial features for better hygiene. It is bigger in size similar to an elongated regular toilet. This is a portable toilet for elderly who need easier access. The armrests can be dropped with a simple push of a button. This helps people who need to get on the toilet from the side like wheelchair users. When you remove the backrest, the commode can be used over a regular toilet seat. In addition to movable armrests, this potty also has padded seat and backrest for increased comfort. Handgrips are padded with foam, so they don’t slip. It is heavy-duty and durable. Maximum capacity is 300 lbs. Included with this commode you get a pail, a lid and a splash guard. There are some excellent reviews for this commode, some claiming it is the most comfortable one they’ve ever used. The cushions are very soft. Everything can be adjusted properly, even for very tall people. This mobile toilet is the best choice for people who carry more weight since it has a weight capacity of up to 500 lbs. With 23 inches between armrests, it’s extra wide so you don’t have to worry about room. The height is adjustable from 16½ to 23½ inches. Like most others on this list, it can be used as a seat over a regular toilet for improved comfort and safety. The pail is steel and easy to clean. 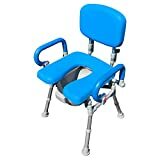 This commode can also be useful for people recovering from surgery or with hip problems. People who tried it say it is sturdy, comfy and wide. The arms are strong and can hold a person’s whole weight, helping you stand up. The seat is made of plastic but it is high quality and durable. Using a bedside commode shouldn’t be difficult. Here are few tips on how to use a bedside commode. When you buy it, you should adjust it for the person who is going to use it. The height of the seat should be optimal so the person can sit down or get up easily. Toilet paper and wet wipes should always be nearby. Before use, pour a little water in the bucket for easier cleaning. Make sure the potty chair is stable. You don’t want it moving around. A person using the toilet should always grab the handles firmly when sitting down or getting up. When done, you should always clean the commode thoroughly and as soon as possible. Check out this quick video as a therapist walks you through some of the details. Some mobile toilets can be used on top of regular toilet seats, as I’ve mentioned earlier. 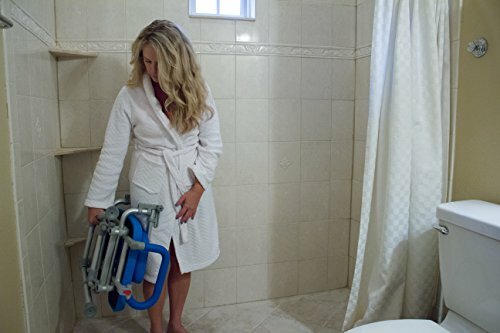 This feature improves safety for the elderly when getting up or down because commodes have handlebars on the sides to help them remain stable. Also, most regular toilet seats are too low for people who have problems with joint pain or weakness. This elevates the seat making it easier for them to use the toilet. However, if you want to use a commode like this pay attention that the one you buy fits the toilet you have at home. This video shows you how to set up a bedside commode for use over a toilet. 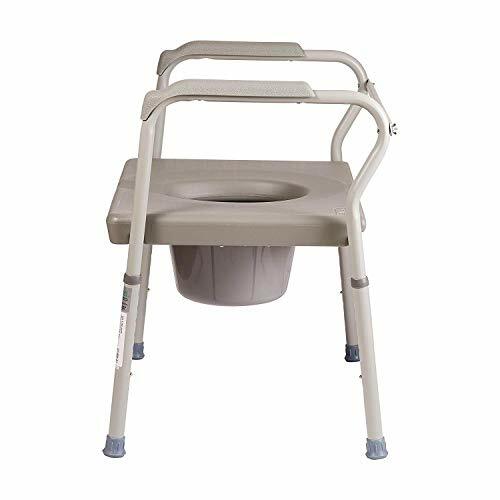 When shopping for a bedside commode the most important feature to look for is that the elderly person can use it easily, without problems. Proper Size. This means it has the right height, it is wide enough and it is strong enough to hold the person sitting. Check the product specifications to make sure the product fits your needs. Portability. 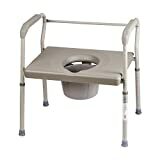 In addition, it helps if the commode can be folded and stored. Cleanability. Also, it’s important that a potty is easy to clean. Stability. Next, some of the chairs have wheels which help move it. This can be helpful if it is being used in a shower. But if the chair will be used in the bedroom or over the toilet, get one with rubber tips on the end of the legs to keep the chair more stable. Durability. Finally, you want a durable product. I’ve already mentioned the weight, some have the capacity of up to 500 lbs. You don’t want your commode rusting or the plastic cracking. There are a few common concerns about mobile toilets that people have. I will try to help and explain so you have a clearer picture when getting one. How do I Clean a Bedside Commode? It’s not a fun job but most commodes are easily cleaned. First, the bucket should be emptied as soon as possible into the toilet to eliminate odors. Next, you should clean the container with a toilet brush, disinfectant, and warm water. The body and frame of the commode chair should be wiped with disinfectant periodically. An even easier way to clean commodes is to use bucket liners. These liners are extremely helpful because they are mess free and waterproof. Simply place them in the commode bucket before it is used. Next, remove the bag and dump any liquid in the toilet. Then, pull the strings on the sides to tie the bag tightly and dispose of it as you would of a regular diaper. I recommend the Tidy Care Commode Liners from Amazon if you want to check those out. How Much Does a Bedside Commode Cost? As I’ve discussed above, you can get a budget-friendly commode for as little as $34, going up to over $200 for more premium products. Are Bedside Commodes Covered By Medicare? If your doctor orders a bedside commode, Medicare Part B will typically pay 80% of the allowable charges for your commode chair. You are responsible for 20% of the charges plus any remaining Part B deductible. Please note that your doctor must accept Medicare assignment, and your commode chair supplier must participate in the Medicare program, or Medicare will not pay anything for your commode. Also, the patient must meet certain qualifications too. A mobile toilet is sometimes necessary to make life easier. I’ve listed five good products, and in my opinion, the UltraCommode is the best one . It is the most comfortable, with many great features that are handy. On the other hand, it is the most expensive one. If that is a concern, or if it doesn’t fit your specific needs, please take a closer look at others listed here and choose the best one for you. As another option, check out tub transfer benches with commode openings. Learn more about those by clicking here. How have you handled nighttime bathroom visits? Tell me about in the comments below. Also, if you know of a potty chair that you recommend, feel free to share that too!